Remaining areas left to be tiled. I went back to tiling today. Cutting, sanding and glueing. Hardly exciting but needs to be done. 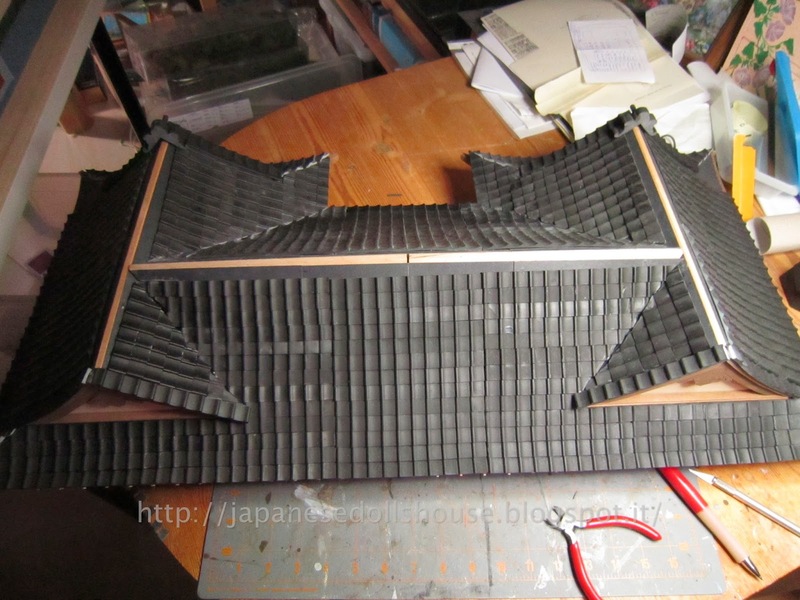 I am working on the back roof of the house now. Lots of tiny pieces to insert into areas that I hope will be covered effectively later (well, not much later). Anyway, I had to finish the back roof areas and then also finish off the last three corners of the peaks. So since I had used some of the tiles previously for the front, I had to open chapter 117 to get more tiles to finish the back and corners. 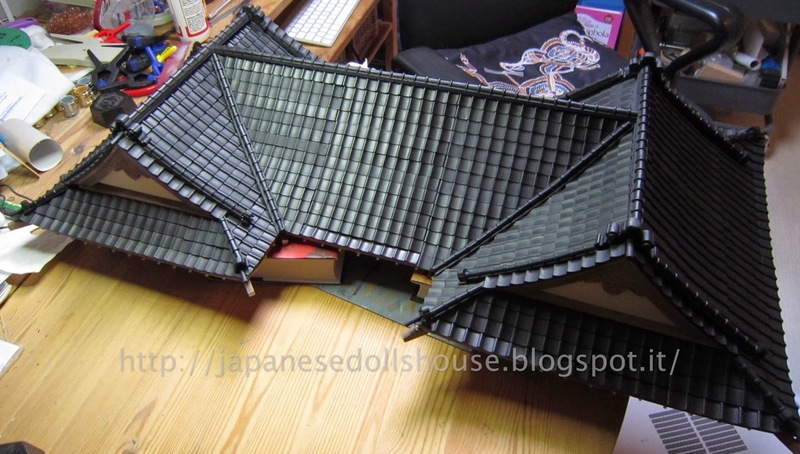 I finished the last two left corners and while the glue was drying, I pulled out Chapter 116 and 118 which were the pieces to finish the top of the peaks of the left and right side roofs. Nearly finished tiling. Just one tiny corner spot left to be done. Chapters 116 and 118 had these pieces for decorating the roof tops. First off, I noticed in fact that I had to add a last row of tiles. This was ok since I still had quite a few tiles to use. 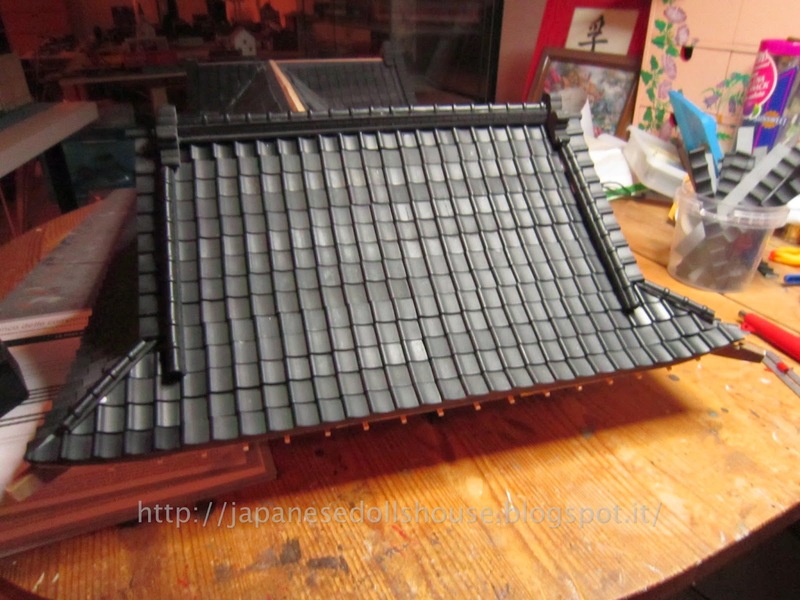 I didn’t add the last row previously since I wasn’t sure if there were large or small filler pieces that would go between the last row of tiles and the top of the peak. In fact, the space was much too large for the filler. So I am now adding as I move along pieces to complete the top row of the tiling. 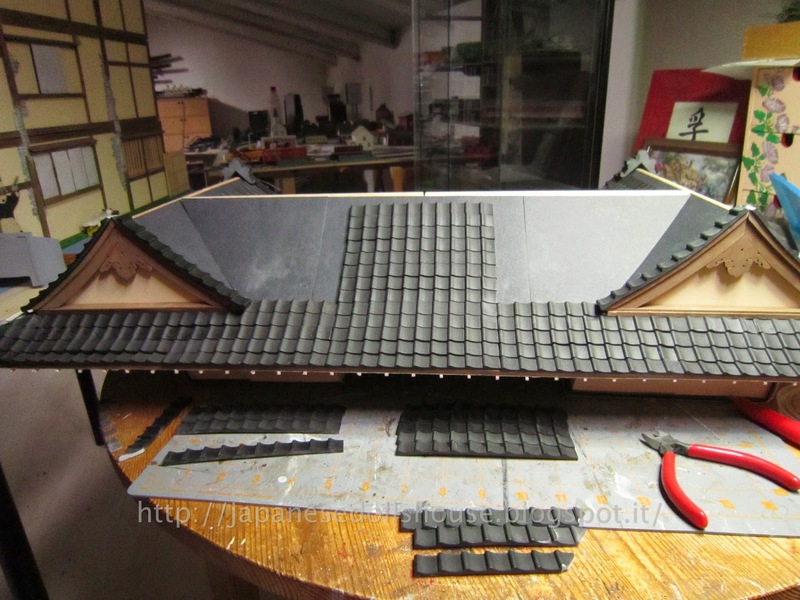 Once the last row dried in place, I started adding the pieces that would support the upper peak decorative tiling. It was necessary to use some pieces as filler and glue in place using fairly big globs. Not only that, for the side peaks I made the mistake of thinking I could glue all the layers together and then place them on the roof. Wrong. 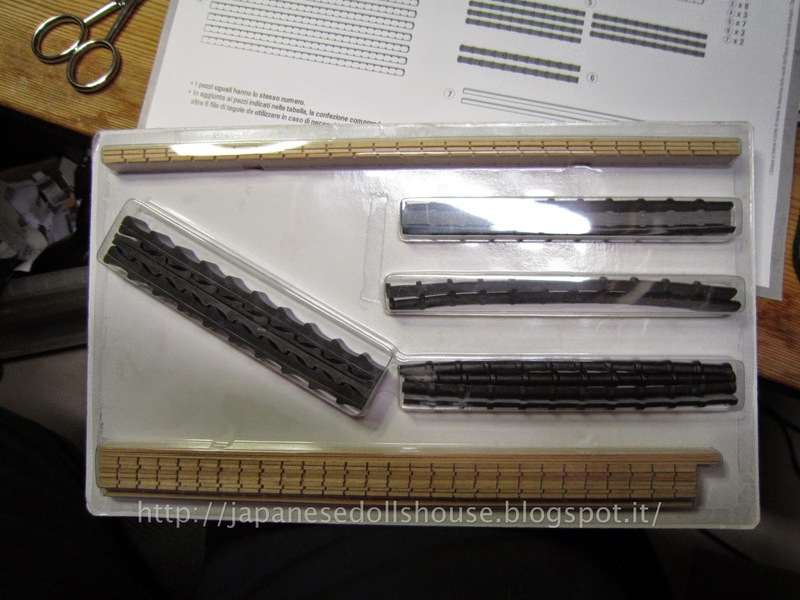 The pieces are thin and notched to permit you to bend them into place and glue. 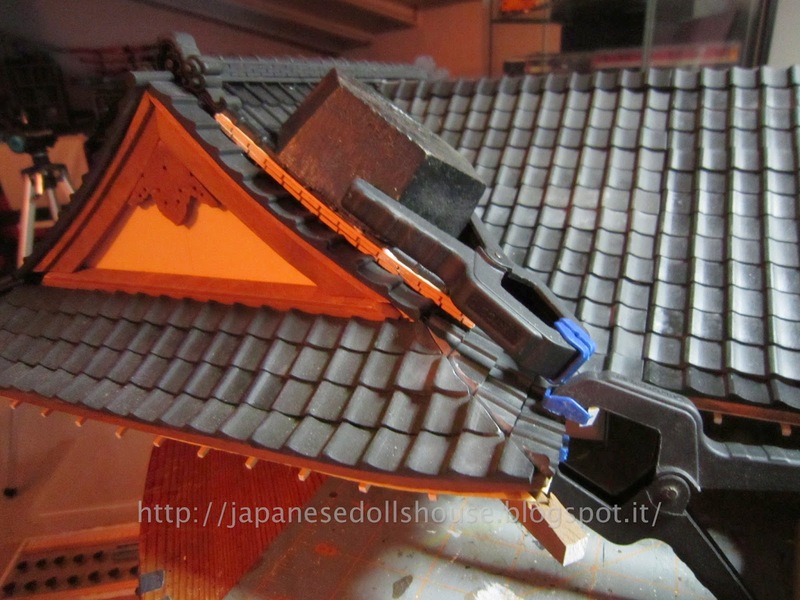 But since I had absolutely no way to hold the pieces in place (my little clamps had no where to “hold on” to) I was forced to hold them in place for a while or use big globs of glue and my weights and just hope that gaps are not so visible from the front of the house. So again, I lost time waiting for glue to dry. But at least now I know how to proceed for the rest of the roof. Two side pieces and the top added. Creative weighing down to adhere to the curve of the roof. You can see the structure of the pieces to allow some bending. Not much tho. Adding the corner support. The front of this part of the roof has been painted. 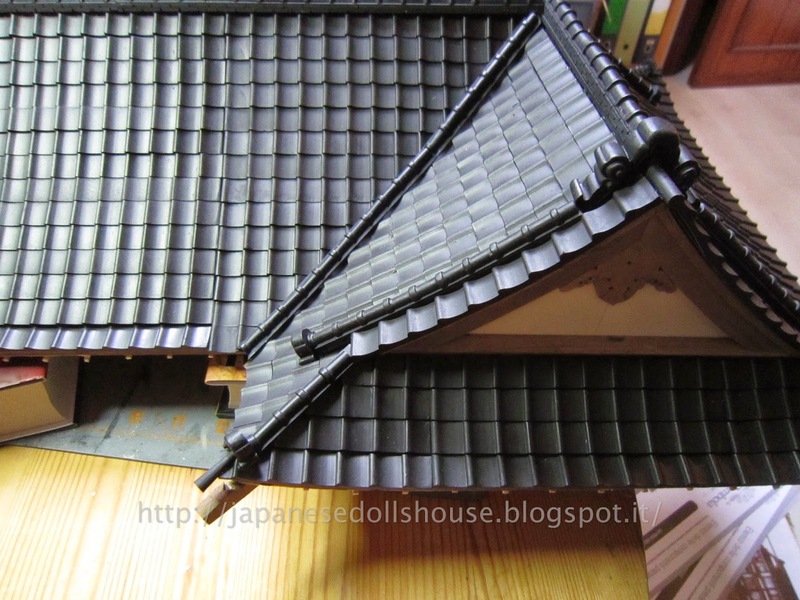 I then attached more gable decorations at the back of the house (using one that came out lousy from the front) and attached some of the angled peak end decorations as well (from chapter 119). Things are overlapping a bit since I am working while waiting for areas to dry. 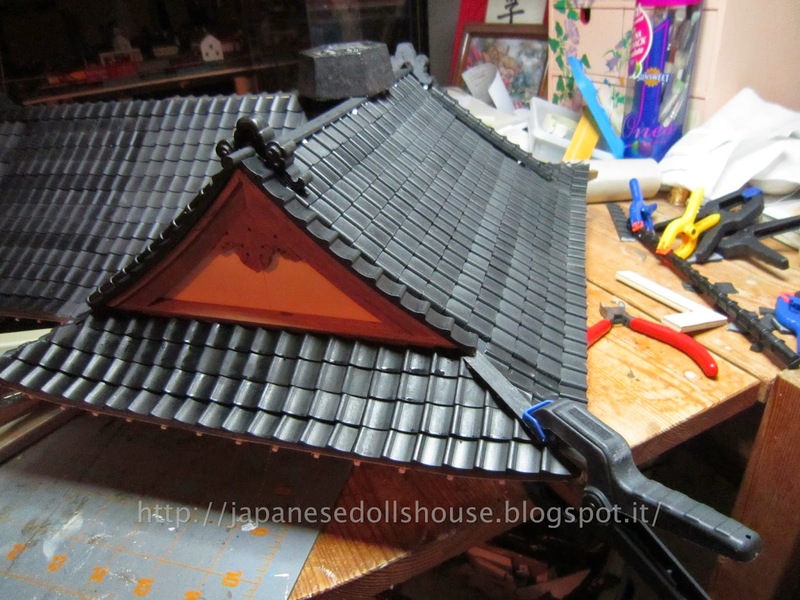 Waiting for the front to dry, I finished the last corner to the right front roof, added the corner decoration and painted black under that gable. Working this way, I moved ahead by rotating jobs. Some of the things I screwed up on but for some reason the kit came with an abundance of pieces so I just ripped them off and started over. You can see the difference betwwen the painted tiles (right) and non. Anyway, by Monday the 17th I was getting ready to add the last of the edging to cover where the tiles meet in the front. 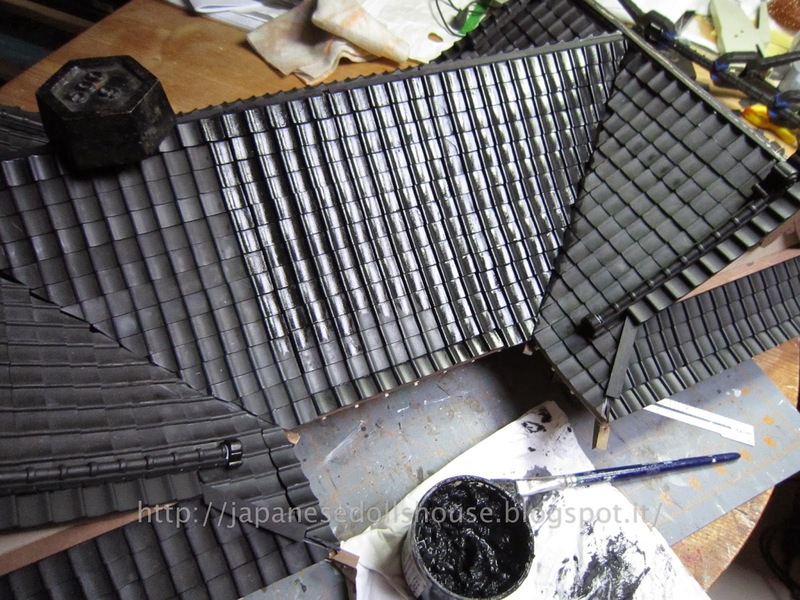 I finished painting the whole roof and must say now the surface does look nice and even. Painting complete and adding the final covering pieces. 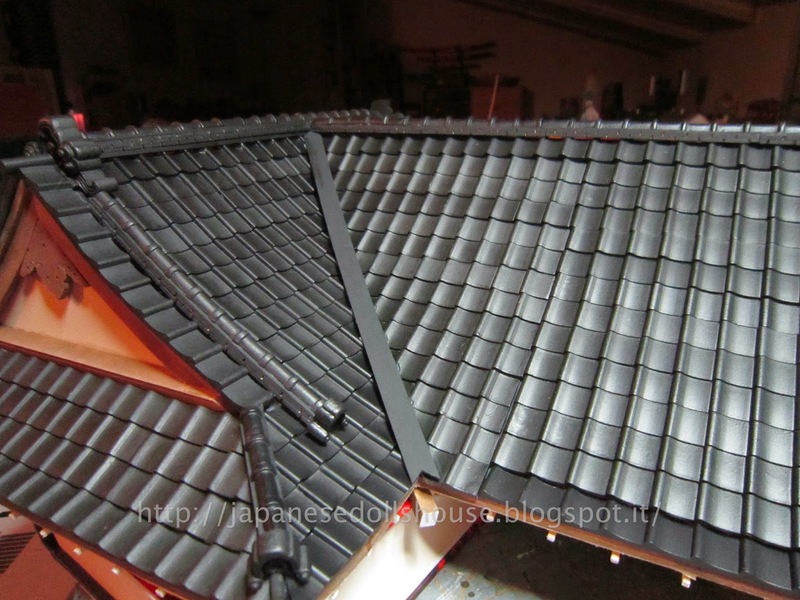 The final part was just adding the two decorative pieces to the back of the roof to hide the tile junctures, then the back left corner piece. 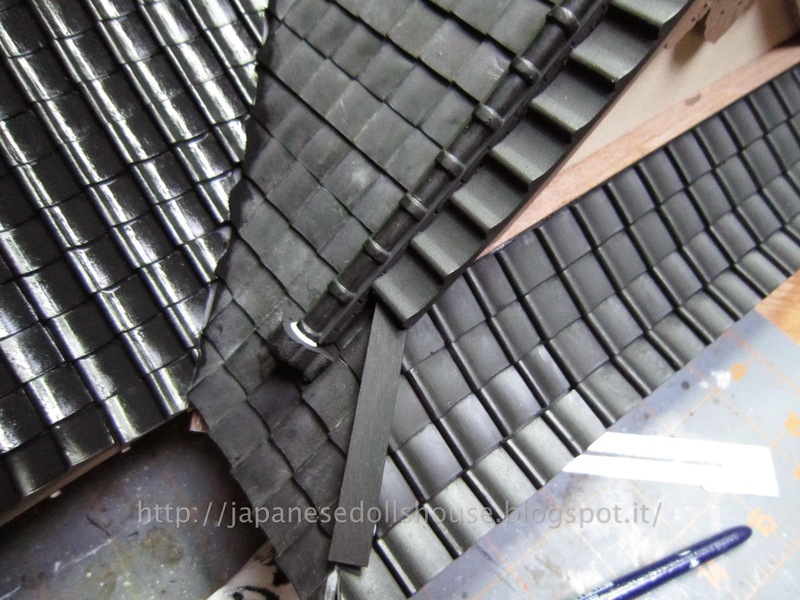 I had some extra decorative “gable pipes” so I cut them to size and glued them to the front tile cover pieces. No need to waste extras. And the roof is fu@king done!!! I cannot believe it!! And it weighs a ton! 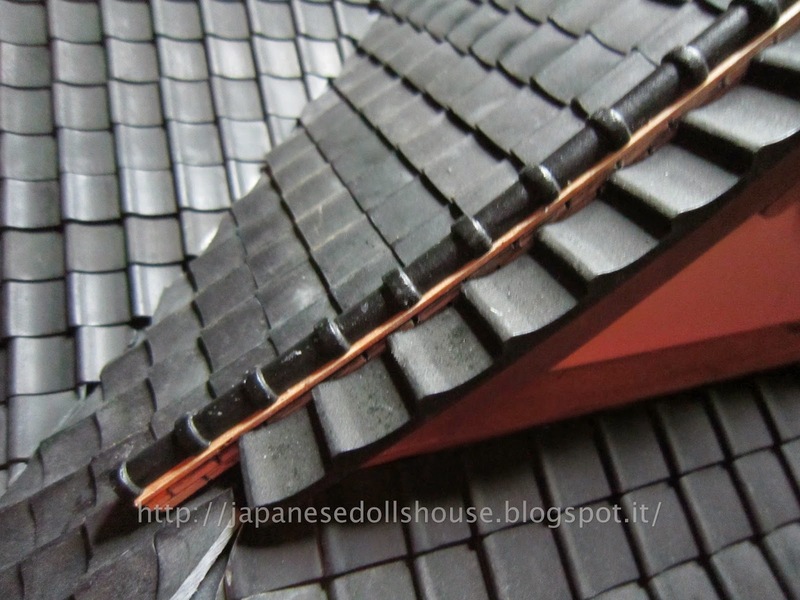 Detail of the corner, gable and juncture areas of the roof. Next chapter....attaching the damn thing!! !